When first installing the Tom Waterhouse iPhone app you will notice the familiar green color scheme that is used in his TV ads and website. Its very easy on the eyes and especially in the dark as there isn’t a lot of white making it too bright like other mobile betting apps on the market. Every time the app is opened you are greeted with the racing next to go list and I found it very handy at the track when betting in a hurry. 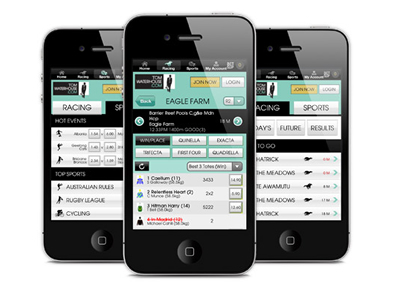 The Tom Waterhouse iPhone app also has a great results section that gives users every racing results not only for the current day but a full list of results from the previous day. What I liked most about the iPhone app was its simplicity when getting a bet on. The buttons are nice and big in the menus and when placing bets so there isn’t any wrongly pushed buttons. All your favourite racing bets are a finger push away with First Four, Quadrella, Trifecta, Quinella and Exacta are all listed and made easy to pick runners and to box them up. A full list of sports are also in the app with the upcoming sports that are just about to start up the top. When a sport is chosen the head to head betting optioned is given making for quick H2H betting and a drop down menu is just below it with all the other betting markets that are available for that sport. Eg. AFL top goal scorer and first scoring play bets. Deposits and withdrawals are made in the main menu and with ease. There is also a transaction history section listing all your winning/losing bets made. The App doesn’t have live chat like the Sportsbet iPhone app but it gives links to open the mail app and a button to ring them directly which works well enough. Tom Waterhouse is giving new punters a massive $250 free bet that can be used on the iPhone app. Simply make an account on your PC or the Tom Waterhouse iPhone app and make a deposit. When you have placed your first bet that amount will be instantly refunded 100% up to $250.